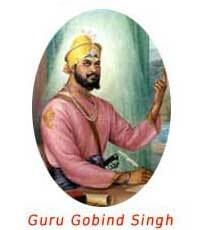 Tenth of the Sikh Gurus, Guru Gobind Singh (1666-1708 C.E.) lived during an extremely dangerous time. His father, Guru Teg Bahadur, had sacrificed his own head to protect freedom of religion for Hindus, who were being threatened with conversion or death by zealous Muslim rulers. Abduction of women and pillage of goods were rampant, but the people were too timid and terrorized to resist. In the midst of this political situation, Guru Gobind Singh gained great stature as both saint and soldier: a leader of firm spiritual principles and intense devotion to God, and at the same time, fearless dedication to protecting all people from oppression and injustice. In 1699, he dramatically initiated five men from the lower castes as his Five Beloveds, blessing them with great courage as well as nearness to God. They became models for the Khalsa, the order of the pure which Guru Gobind Singh created to stand on the front line against injustice. The Khalsa were held to a very strict moral and spiritual discipline and under Guru Gobind Singh’s courageous inspiration, helped to turn the tide against Mughal oppression in India. In addition to his spiritual and military leadership, Guru Gobind Singh was a gifted intellectual, and had many poets in his court. He was inspired to write many powerful spiritual compositions, including Jaap Sahib, but did not include them in the Sikh scripture, the Guru Granth Sahib. His writings have instead been collected in a separate volume, called the Dasam Granth. Upon his passing away, he instructed his Sikhs to regard the Guru Granth Sahib as their teacher. Guru Gobind Singh is greatly revered at Gobind Sadan, for he is one of the two figures who began appearing in vision to Baba Virsa Singh when he was a boy and who continues to guide and bless his work.